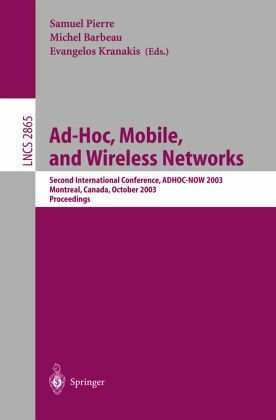 This book constitutes the refereed proceedings of the Second International Conference on Ad-Hoc Networks and Wireless, ADHOC-NOW 2003, held in Montreal, Canada in October 2003. The 23 revised full papers and 4 revised short papers presented were carefully reviewed and selected from 42 submissions. All current aspects of ad-hoc networking, mobile, wireless, and cooperating communication systems are addressed including network architectures, access control and discovery, multicasting protocols, performance, quality of service, QoS, routing protocols, scalability, security, and self-configuration. AdHoc Networks are wireless, self-organizing systems formed by co-operating nodes, within communication range of each other which form temporary n- works. Their topology is dynamic, decentralized, and ever-changing, and the nodes may move around arbitrarily. The last few years have witnessed a wealth ofresearchideasonAdHocnetworkswhicharemovingrapidlyintoimplemented standards. Mobile computing, particularly wireless-enabled mobile computing, covers a large area of applications in mobile computing environments, networking, c- municationdevicesandsystems.Thisconferenceexposesexperimentalaswellas theoretical research in adhoc, mobile and wireless networks. The range of topics covered includes management of power consumption, architectures and pro- cols, quality of service, and security. The aim of the conference was to provide a unique opportunity for researchers and students in industry and academia to participate at an annual forum and share their research results and experiences. This conference followed the ?rst successful conference (held at the Fields - stituteinTorontoduringSeptember20 21oflastyear),andwasheldattheH- iday Inn, Midtown in Montreal during October 8 10, 2003. It was co-sponsored by the Mobile Computing and Networking Research Laboratory (LARIM) of the Ecole Polytechnique de Montr eal, theSchool of Computer Science (SCS) of C- leton University, MITACS (Mathematics of Information Technology and C- plex Systems), and the Association for Computing Machinery (ACM).